“AROSA” Ltd. was founded as Engineering Consulting Company and since 1982 "AROSA" Ltd. began act as Construction and Technological Design Division under of the "Neiron" State Company. 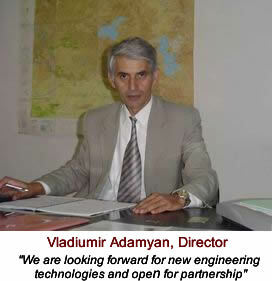 In the period 1982-1994 "AROSA" participated on design and construction of the largest Armenian industrial complexes. During this period our engineers also developed the Construction Management and Technology Design for the "Sasuntsi David" and "Marshal Bagramyan" Stations of Yerevan Underground. After Armenia got independence "AROSA" Ltd. was reorganized and in 1994 was reestablished as a private engineering company. The staff of company based on engineers whith many years engineering experience in the main design and construction institutions of the former USSR and the same time young engineers with modern engineering and CAD knowledge. The engineers of “AROSA” involved also in scientific research programmes on construction and seismic resistant areas. Today we use CAD systems in each stages of design developing, beginning from survey, structure analysis to drawings issue.